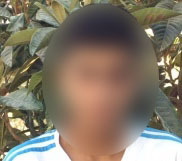 On 26 August 2018, a 15-year-old youth is arrested after he attended Binyamin Police Station in response to a summons delivered at 2:00 a.m. He is released on 13 September 2018 after his father paid NIS 3,000. On 20 August 2018, my sister woke up when she heard noises outside our house at 2:00 a.m. Then she heard loud banging at our front door. My mother opened the door and about 13 Israeli soldiers entered and asked for my father and me. My mother told the commander we were sleeping over at a relative’s house. The soldiers then searched the house and caused a big mess. An hour-and-a-half later they left. On 23 August 2018, my mother woke up again at around 2:00 a.m. to the sound of banging at our front door. Before she could open the door, soldiers broke the lock and stormed into our house. About 11 soldiers entered this time and told my mother they were looking for me. My mother told them I was not home. 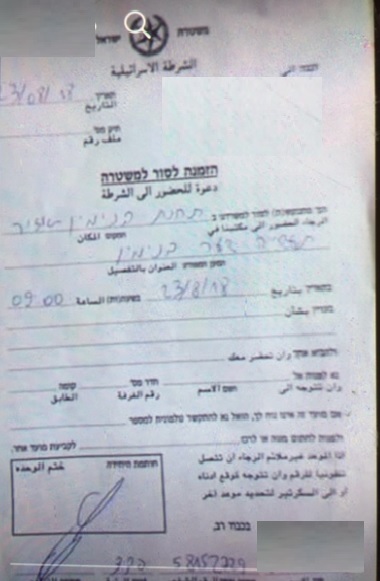 The commander then gave my mother a document summoning me to Binyamin police station in the morning at 9:00 a.m. The information in the summons was written in Hebrew. Later that morning my father and I went to the police station as requested. We waited from around 9:00 a.m. until around 11:00 a.m. when a soldier told us to come back on Sunday, 26 August, because the interrogator was not at the police station. On Sunday, 26 August, my father, my uncle and I went again to the police station inside Binyamin police station. My father waited outside because he wanted to leave to go to work and my uncle and I went in and waited. About an hour later a policeman told my uncle to leave and I was taken for interrogation. The interrogator wore an Israeli police uniform. He started to question me without informing me of any rights. He accused me of throwing stones and showed me two photos and accused me of being the person shown in the photos. I denied the accusation and denied that the photo was of me. He also accused me of organising young boys and encouraging them to throw stones. When I denied the accusation he swore at me saying I was a “son of a whore”. He banged the table and raised his voice at me. Then he asked me whether I had ever harmed settlers and I told him I had not. The interrogator then threatened to bring my father and mother to the police station if I did not confess. Then he told me somebody had confessed against me. When I asked him to confront me with that person he said he was not going to. Then he told me to say sorry for throwing stones and I told him I did not throw stones and so was not going to say sorry. At the end of the interrogation the interrogator showed me documents in Hebrew and asked me to sign them but I refused. He told me he would send me home if I signed; still I refused to sign and told him I was not going to sign any documents without a lawyer present. Then the interrogator called my father and asked him to appoint me a lawyer. My father told him I did not need a lawyer because I was innocent and the interrogator hung up immediately. Then the interrogator called a lawyer and allowed me to speak to him. The lawyer told me not to confess to anything even if the interrogator shows me photos. After the interrogation was over I was shackled and handcuffed. The handcuffs were behind my back and were painful. I was then taken to a small room which was very hot. When I tried to fall asleep a soldier kicked me and woke me up. I complained to the soldier that the handcuffs were causing me pain and he removed them. I was left in that room and I was not given any food or drink and I was not allowed to use a toilet. The next morning I was taken to Ofer prison where I was left in a room until the evening. My parents tried to find me during this time and called all the police stations but none had any information about me. Then I was searched with my clothes on and taken to Section 13 where I ate and drank for the first time. Two days later I was taken to Ofer military court. My father attended the hearing and the military court decided to keep me in detention and the hearing was adjourned. In all I had five military court hearings. My lawyer told the military judge I was sick and needed medical care. My father presented a medical report to the court. At the last hearing the military judge gave my father the option of paying 3,000 shekels for my immediate release or imprisoning for 3 months. My father objected and told the court there was no evidence against me and that I had not confessed. The judge told my father 3 soldiers had testified against me. My lawyer objected to the military court because the charge sheet said I was accused of throwing stones near the village but the prosecutor said I was accused of throwing stones in a village near Jerusalem. In the end my father told the judge he was willing to pay NIS 3,000 in return for my immediate release. He explained to the judge he wanted me back at school as quickly as possible. On the day when I was supposed to be released I was told my file was lost and I had to spend another day in prison. I was finally released on 13 September. I went home with my father and we arrived home after midnight. My mother and sisters were waiting for me and we all had dinner together with some friends and relatives. In prison I passed time playing table tennis but I was bored most of the time and wanted to go home.